ReMarkable Home: Pinteresting Tuesday: 10 Easter Subway Art Printables! Pinteresting Tuesday: 10 Easter Subway Art Printables! I thought it would be fun to round up some Easter Subway Art for you. There are a lot of cute ones out there. I thought about making my own, but with so many great ones out there to choose from, why would I? 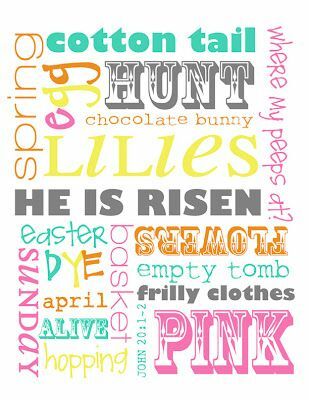 I think I will print a couple of these off, one that is about bunnies and eggs, and one that is about the Savior of the World, whose Resurrection we are celebrating! Take a look and let me know which is your favorite! Chalkboard art is all the rage. This was the only Easter one I found. She has a vertical version as well. I love it! This one has words going all directions, which is fun! I like the simplicity of this one and the colors are a little muted. I love this one. There are a couple other color choices, but I like this one for someone who doesn’t want the bright Easter colors. And I love that it’s all about the Savior, which is what Easter is really about. The vibrant colors on this one are so pretty. I love these colors also and the super cute fonts, too! This one is different but I love it. SO pretty. Love these words from a hymn. This one is pretty in pastels. Another one all about Jesus. Very pretty. This one is super cute. Love the blue! Last year I had the idea to make a Subway Art Birthday Gift for one of my sisters. I printed off Subway art for each month, cut it to fit an 8x10 frame, and gave them to her with a frame. All she has to do is switch them out each month. It’s a great gift! You can find that post HERE. Do you like Subway art? Do you display it? Where? Thanks for all the great posts! I love getting emails from you. So creative! Happy Easter! This is a great collection, thanks Emily! Pinning to my printables!